First off, this DMC-12 was put into creation by a former NASA electrical engineer, and contractee for Universal Studios in Florida. Many many hours of research concerning electrics, materials, aesthetics etc were put into the build. 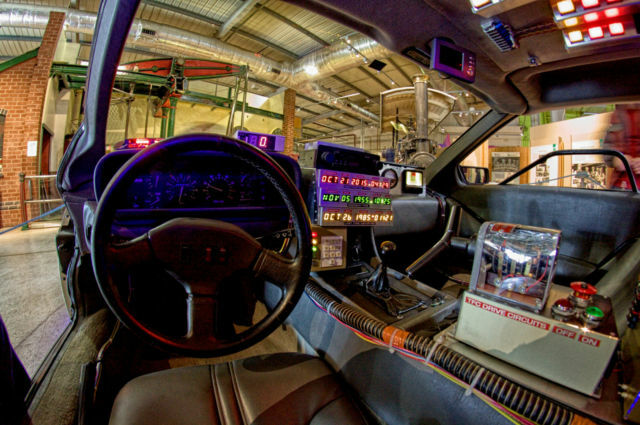 To put it into perspective: 30 fuses and 22 relays control the car’s electronics that all feed the props just as seen in the Back To The Future movies. 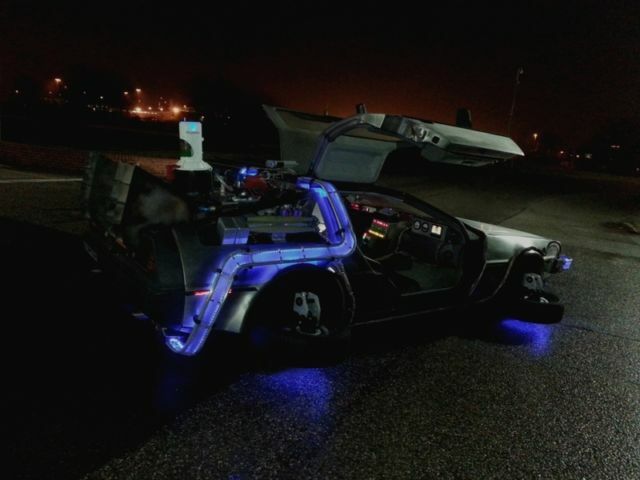 The time drive handle activates all of the cars props – unlike other replicas, the special effects actually come from the individual props themselves. 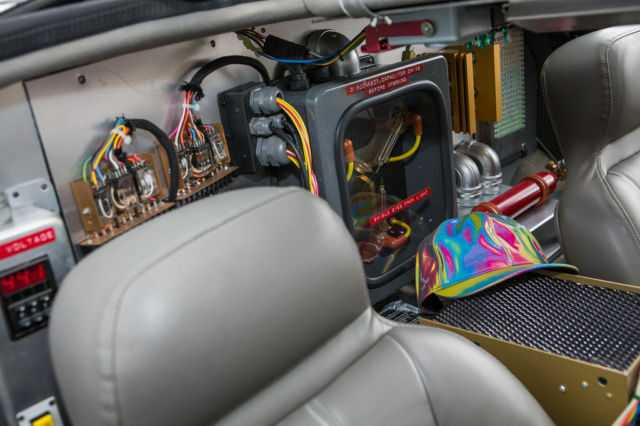 Even the time circuits are fully programmable, and all the other memorable props have been created with extreme accuracy including the Flux Capacitor, Status Indicator, Mr Fusion and the Plutonium Gauges. To create atmosphere at events, there is a fog machine under the bonnet, with pipes running underneath the car to the rear vents with two exhaust vent lights. 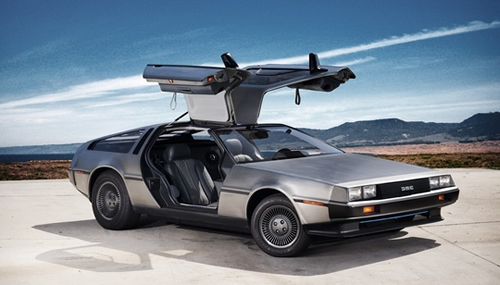 I think the most unique trick up this DeLorean’s sleeve is it’s 2015 hover illusion. When put into action, custom wheels make the car look like it is hovering. 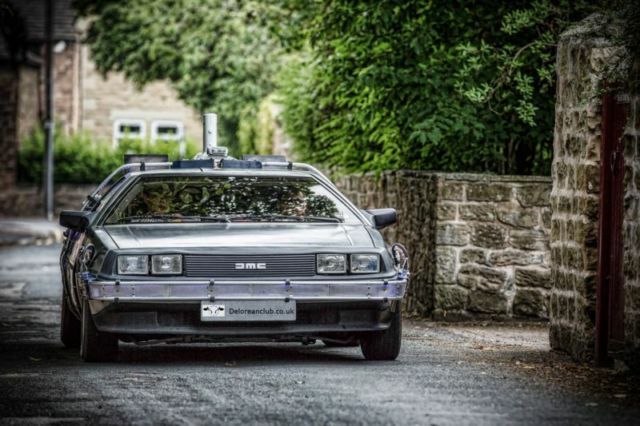 The DeLorean also features a 12 channel wireless remote control, allowing you to activate many of those memorable theme tunes and sound clips from the key characters of the movies. They link to 2 discreet external speakers hidden under the bonnet and the engine bay or the car, as well as an internal speaker so that you can drive along to your favourite Huey Lewis tracks and provide entertainment with many quotes. It’s a superb build and I adore the effort, dedication and craftmanship put into this labour of love. Growing up in the 80s, I thought this car was great, although it had nothing on the General Lee – The Good Ole Boys were (and still are) my heroes.